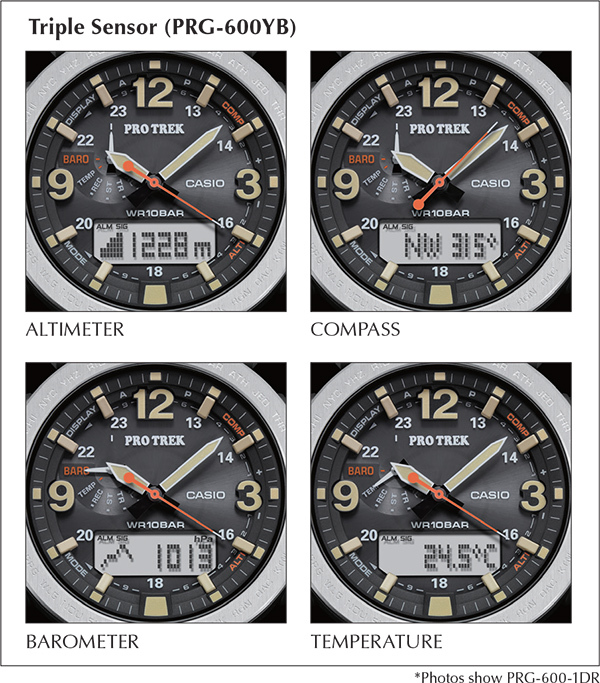 From the PRO TREK PRG-600/650 Series of Triple Sensor watches that keep you in touch with the constantly changing natural world around you come models. The case, band, and other major parts are done in uniform black, while the Navy blue. Function-wise these models incorporate Triple Sensor Version 3 for better measurement accuracy and shorter measurement intervals. Other features include a barometric pressure alarm that alerts the wearer to sudden noteworthy rises or falls in barometric pressure, double LED lighting with separate illumination for the face and LCD, and more. These new models add a variety of new design enhancements, without sacrificing any PRO TREK functionality. 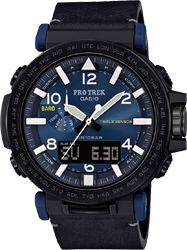 The PRG-600YB/650YL models feature ion-plated bezels. 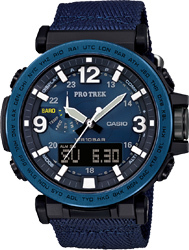 The PRG-600YB comes with a band done in navy blue colors. Everything about these models is designed and engineered to create functions and designs for outdoor activities.